Dj 1Luv was very professional and flexible! The Dj had the entire audience on the dance floor! I would recommend Dj1luv for any special event! 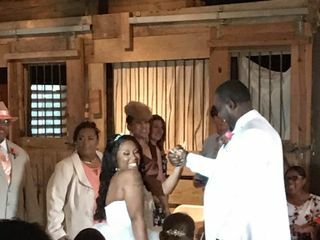 Booked Dj 1Luv for our wedding and I’m glad we did. He was Very professional and easy to work with. If you want a dj who will get the party started he is right guy. DJ1Luv was live, entertaining, humorous and kept the party going!!! We will definitely use his services again!!! 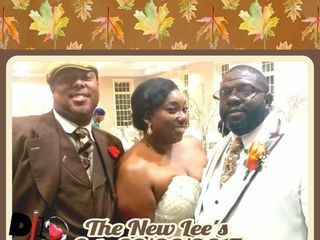 I booked DJ 1LUV for my wedding 10/13/18 solely on reviews alone. After interviewing other DJ’s I just felt like he was the better fit for what we were looking for. Every review he had was 5 star and everyone spoke very highly of him. After talking to him on the phone he was so professional and everything just seemed meant to be. We booked without hesitation! He checked on us leading up to the wedding and even made our ceremony CD at the last minute for us. He was prompt and had all of his own equipment. He kept the party going all night we literally closed the reception venue down. Everyone is still talking about that night he was amazing. Book him you will not be disappointed. I love how you kept our wedding non stop entertaing. They loved how you had the music flowing and everyone was asking how I found you. We all loved how you came out and danced with us. DJ 1 Luv was fantastic. Very flexible and fun. He was on time for rehearsal on time the day of our wedding. Very professional. I would definitely recommend him to any of my friends and family. One of the best DJs the city has to offer. Kept it rocking all night long and even got ou there and danced for a bit. Much love. 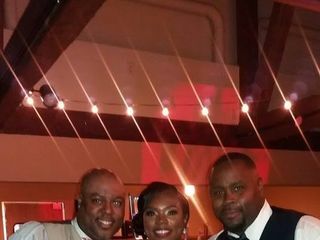 The Paynes!!! Thanks so much for the review Mr. & Mrs. Payne! You guys literally made me feel like family from beginning to end! DJ1LUV was awesome to work with from start to finish! He was proactive by letting us know what he needed from us via a template he had already prepared, and he was also able to provide a lot of tips on the recommended flow of the reception based on his many experiences DJing weddings, making himself accessible for questions that I had whenever they came up. During the wedding ceremony, he made sure we had everything we needed and cued the songs up with perfect timing. He was an awesome and fun MC at the reception, and the music choices were on point! It was an amazing, unforgettable party, and everyone kept telling us how much fun they had and how much they enjoyed the music and atmosphere. Oh, and in case you are like my now husband who doesn’t like a DJ who talks over tracks relentlessly, DJ1LUV is the DJ for you! He did just enough to keep the party live and hype, but allowed his musical selections to do the talking for him and the party. He is great, and I recommend him to anyone! DJ1luv, kept the party going with the music I requested! We danced the night away! I would refer him for all events needing a DJ! Thanks so much for the review! You guys made feel just like family! Here's to a couple of forevers! Dj1luv was absolutely amazing! We had him as the dj during our family reunion banquet! He was professional, interactive, and most importantly, FUN! He was very patient with my family and they all loved him! Would definitely recommend for your event! Look no further! He is the man with a plan. He keeps the crowd engaged with pure entertainment from the start until the end. The DJ has a great selection of music for young and older group. He dresses for the occasion. You will not be disappointed with his services. DJ 1Luv is incredible, to say the least! My wife and I had been to several events in which he was the DJ, and each time we left saying, "The DJ was on point!" When it was time for us to hire a DJ for our wedding, the choice was practically made for us! 1Luv was very professional, personable, and in constant communication with us. it was easy for us to put our playlist together, he even thought enough about us to ask what the colors of the wedding were so he could be in line with them. 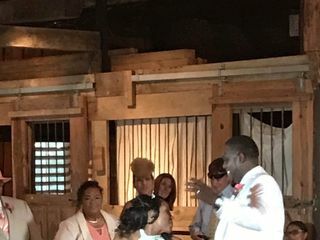 He was prompt in setting up on our wedding day and made announcements for us before the ceremony, and had the reception grooving like the party it should be!! I would not hesitate to have 1luv DJ at another event for us! DJ 1 Luv is by far one of the best DJ’s in the MidSouth. He pays close attention to making your special event memorable. Thanks so much the review & you guys made me fill like I was apart of the family! DJ1Luv is THE MAN!! Not only did he play the wide variety of songs I was hoping for so that all the wide variety of guests had something they could appreciate and dance to, he created custom song mash-ups for me and QUICKLY. My hubby and I wanted to have a custom intro song made for us before we walked in, and he created exactly what we wanted! We had a family dance as well that required bits and pieces from a variety of songs, and he made them flow together seamlessly!! He loves to get involved with the crowd, so if you don't spot him up front, it may be because he's dancing right along beside you! He will NOT let the dance floor stay empty! He'll make sure of it. No one wanted to leave our dance floor/reception even on the last song! He is the BEST, and SO affordable!! - a DJ gem in my eyes, seriously! You will not be let down with Levelle! He's there to make sure you have the greatest night! Oh and he always shows up looking dapper in his suit! THE GABBS ARE HERE!!! Thanks so much for the review & it was a honor to be able to do brothers weddings & they both have amazing wives! Hire DJ1LUV and you will not regret it! He is super responsive, professional, and goes above and beyond to make sure you are satisfied. We had the BEST time with him and our guests raved about him. If you’re looking for a wedding DJ, you cannot go wrong by hiring him! Thanks so much for reviewing my services! 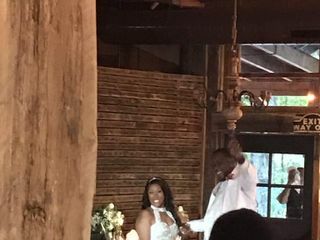 It was a honor to be apart of this amazing union!!! Thanks so much to the crunkest bride of 2018! The Boyds ROCK! When I say the best, I literally mean the BEST! from the time I spoke with this gentleman up til my special wedding day he was great! I have never met such a loving professional and caring dj in my life! and I know quite a few! very prompt did my wedding and reception! know how to feel his crowd and even will join in lol he is the best I could go on and on but Im still honeymooning! I give him 5 thumbs up! 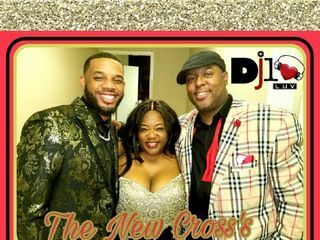 DJ1Luv is the BEST DJ in Memphis, as a matter of fact the country! He truly enjoys what he does and it shows. We hired him for our wedding (12/22/17) after attending a wedding where he was the DJ! He is professional, fun, timely, and appropriate! He knows when to play what for a great event! We couldn’t have asked for a better DJ! 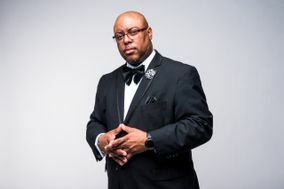 If you are in search of a DJ for your special event, search no more DJ1LUV has an extensive play list and he will even wear your Wedding colors! Thanks so much for the review here on Weddingwire! I truly enjoyed sharing this special milestone in y'all lives! I enjoyed working with you all from beginning to your wedding day. The Pollards will do some amazing things together in life because of the love y'all share with each other! Great Service!!! He’s very professional and knows what he is doing!!! He keeps the party going and has every type of music!! I recommend him for any type of party you will have!!! Our experience with DJ1Luv was nothing short of awesome!!! From our first phone conversation to the day of the ceremony he was nothing but professional and fun!!! He helped us find our photographer/ videographer and even basically coordinated our ceremony!!! He even coordinated his attire to match our wedding colors and his DJ set up was not your typical table and equipment. He really made sure everything was nicely decoratored to accent our beautiful venue. Any type of music you can think of he can play!!! He truly became a friend to us and made our day very special and so much fun (we partied till the time was up)!!! I would recommend to everyone and will use him whenever I need DJ services from now on!!!! DJ 1Luv is amazing! He is very down to earth and a great DJ. His clients definitely come first to him and he aims to please. He's very responsive and is willing to work with you to make your event special. Our wedding was amazing and he made it unforgettable. Outside of the wedding playlist, we didn't have any special requests but it was like he knew what we wanted to hear and when we wanted to hear. Highly recommend him for special events! Thanks so much for the review Mr & Mrs. Cross! You guys very fun to work with & wish you guy happily ever after!!! Absolutely amazing I enjoyed my wedding day. I am still getting great compliments about my DJ. Book him you will most definitely be glad you did. Thanks so much for choosing DJ1LUV Entertainment & thanks for the review!!! DJ1luv is simply amazing! He was very professional and well organized. He kept the party going on my wedding day and I would recommend him to any blushing bride that is wanting a memorable night!